Download compensation plans based on country, language or region. Why is the Trévo compensation plan so great? This compensation plan has been carefully developed as a way to EMPOWER you and your dreams. With this plan, you can actually make money from day one**, create a residual income, and be rewarded as your team grows and develops through your leadership. Trévo’s compensation plan utilizes a single-line matrix system that is new and unique to the industry. As you develop as a leader and grow your team, our system allows you to benefit from each and every person who joins Trévo after you. When you build a team in Trévo, your personal team is actually a part of the Trévo global team. Our compensation plan includes EIGHT POWERFUL WAYS for you to make money through Trévo, which can equip you to achieve a life of excitement, fulfillment, and financial freedom. The power of the Trévo opportunity is the single-line matrix compensation that is new and unique to the industry. This innovative system allows you to benefit from every person who joins Trévo after you through our global team. This amazing compensation plan rewards you for creating success in your personal team through Group Volume. That’s why Trévo is such a powerful global community. Everyone works together and benefits from the company’s worldwide volume. What an opportunity given to YOU by one of the fastest-growing companies in the direct sales industry! 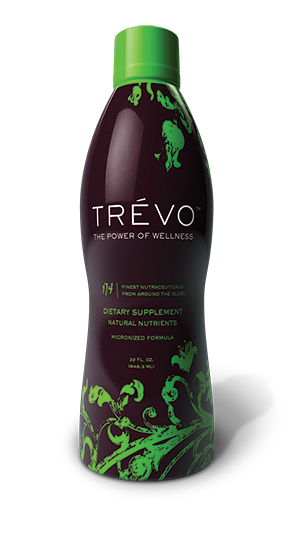 At Trévo, we believe in the nutritional power of our product, and we want to see every household in the world have access to the amazing wellness found in each bottle. That is why we are thrilled to offer tremendous retail pricing on our 32-ounce bottles, as well as our 2-ounce Trévo 2Go’s! We would hate for our product to be limited only to our Life and Health Coaches, so we encourage our members to focus on the retail sale of Trévo, either through a person-to-person method, or through our Elite retail program. As part of the Trévo Elite program, every retail customer – or “Elite Customer” – you register will be placed on your first generation, allowing you to earn tremendous retail commissions. Life and Health Coaches earn commissions on all eight generations through retail sales! EXAMPLE: When Michael, a Life and Health Coach, registers Lisa, an Elite Customer, Lisa goes on Michael’s 1st generation. Furthermore, every Elite Customer that Lisa refers will also be placed on Michael’s 1st generation. With Trévo’s PowerStart Business System, you can develop retail customers and expose potential team members to the product! The goal of every Life and Health Coach should be to sell 24 bottles to retail customers and potential team members in the first 90 days. You can start with any PowerStart System and upgrade to the next level to receive new product to sell while you expand and build your retail business. As an enroller, you can enjoy the benefits of commissions on all 8 generations of your organization as your team develops their business. No matter what level of PowerStart you start at, you can upgrade your system as you develop your retail customers and team members! Your maximum eligible commission is the level you are currently qualified for. When you enroll with a PowerStart System, you are only eligible for the commissions that particular PS level carries. Remember, in order to get your business off to a fast start, we encourage you to sell your 24 bottles to retail customers and potential team members in the first 90 days! If someone in your downline purchases a larger system, you will receive the commissions that you are eligible for only. I know what you are thinking, what about all of those commission dollars that I am missing out on! Don’t worry, you can upgrade your system at any time to purchase more product and expand your customer base. Simply pay the difference between the two systems and also receive the difference in product! 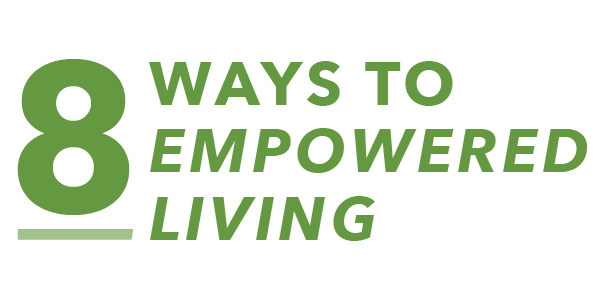 Trévo rewards its Life and Health Coaches for their personal efforts in building exciting, passionate, and growing teams. We believe that the best way to say “Congratulations and Great Job” is by helping you to create a generous monthly residual income. How does compression benefit me? Trévo’s monthly commission compression ensures that you receive the maximum commission possible. Here’s how it works: you are paid monthly commissions on everyone in your first 8 generations who has placed a QVP order in that month. With monthly compression, those Life & Health Coaches in your 8 generations without a QVP order are simply taken out of the equation and other team members from generations below your 8th level are temporarily moved up until all 8 generations are filled. This allows you to receive commissions on all 8 generations. After commissions are paid, your 8 generations roll back to the positions held prior to compression. Bulk orders are definitely the way to go when your retail business grows in order to receive your maximum commissions. Once you have built your Powerstart System to the 24 bottles through retail sales and potential team member sales, you can purchase Bulk Packs to continue exposure to build your retail sales and your team! This commission is paid on all 8 generations. What are global pool bonuses? Team Volume Recognition Pool bonuses are another important money-maker in the Trévo compensation plan. This pool bonus is our way of rewarding sales leaders, business builders, and dream builders for their strong leadership. Trévo reserves 15% of the company’s Group Volume revenue to be paid monthly in 15 separate 1% pools. This amazing global pool bonus maximizes the power of our revolutionary Single-Line Matrix compensation plan, with the result being more income for Trévo’s movers and shakers. When Trévo ships 70,000 Group Volume cases per month, the total monthly revenue will be approximately $7,000,000. Each 1% pool will be worth $70,000 and will be divided by the number of Life and Health Coaches who have achieved that specific qualifying rank. Using this example, if you are qualified at the Blue Sapphire Director level, you will share in four (4) separate $70,000 pools. 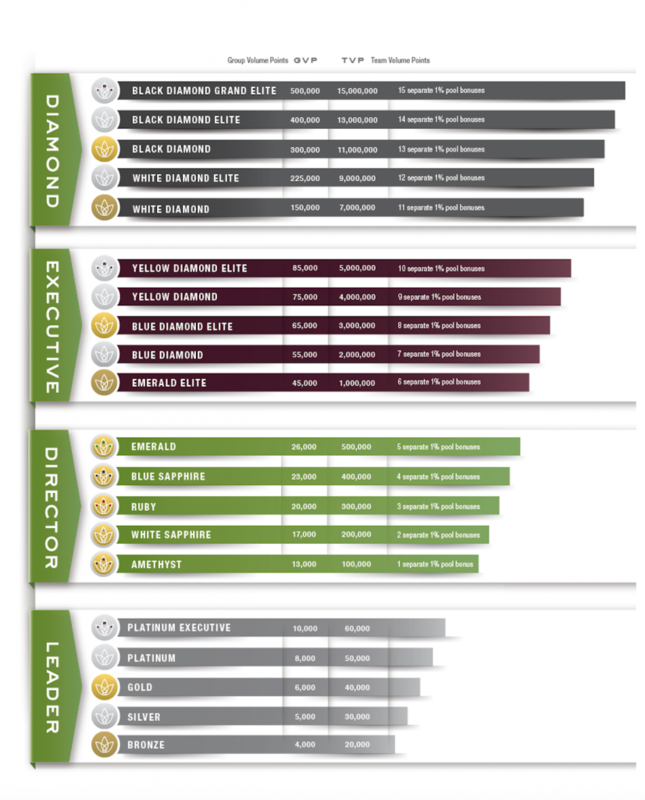 Similarly, if you are qualified at Black Diamond Grand Elite Executive level, you will share in fifteen (15) separate $70,000 pools. ** The above amounts shown are gross amounts and not necessarily representative of earnings. See disclaimer below for details. At Trévo, we believe in truly rewarding our leaders. We have compiled an impressive array of leadership bonuses that will amaze even the most experienced network marketer**. From car bonuses and executive-class travel to cash, Trévo treats its elite field leaders with style and opulence. The Trévo Car Bonus Program is one of the most exciting benefits available through our Leadership Bonus Program. Life and Health Coaches all across the world are enjoying the freedom of the road behind the wheel of a brand new vehicle, and Trévo is making it all possible. Imagine Trévo making the monthly payment on your new vehicle. Everywhere you go, your new vehicle will provide you with the ultimate conversation piece to engage multitudes of people in the Trévo opportunity. The founders of Trévo, Mark and Holli Stevens, firmly believe in the value of giving back. They actively support a variety of charitable organizations and ministries both in their local community and in the global community. Through Trévo, leaders who have achieved Black Diamond Executive status and above will be rewarded with shares of the Trévo charity pool bonuses. These shares will be distributed as donations to charities specified by these leaders, and will be made in the name of the participating leader. The benefit of this charity pool bonus is two-fold. First, these charity pool bonus donations will help make the world a better place. Second, they will highlight participants as successful entrepreneurs who support their communities on both a local and global level.